I hope this update finds you all well. If im completely honest I have not been feeling the greatest. Please be aware this latest update will be a bit of a winge fest. The last couple of weeks have been a bit of a struggle. There are so many contributing factors. Post holiday blues. Oh my take me back to that happy place. I think we can all resonate with this one. I am sure we have all had that moment where you have had to go back to reality? – work, life, bills and it’s just too hard! With my unpredictable work schedule and varied cancer based appointments I have not worked as much as one would have liked. The agencies have been super quiet so its been a bit stressful trying to get work. I have worked through three different teaching agencies recently and have had to do some high school relief/supply which is like glorified babysitting and not that enjoyable. One of the agencies also hasn’t paid me correctly so currently trying to sort that out. You know how it is, drama’s one does not need. I have been going through a brain overload phase where I can’t stop thinking about what I want to do career wise. I am not really enjoying what im doing and I always thought that I would never say that I’d work just for the money but it seems that is happening. Means to an end really. Supply teaching is OK if you keep getting called back to the same school but building relationships over the course of one lesson or a day isn’t easy. In high school it’s near impossible. Teenagers! A couple of weeks ago I had a meeting with the Health and Education Manager at the breast cancer charity CoppaFeel! which went really well. I am looking forward to doing work with them in the upcoming months. I have been looking for work in the charity sector but it is hard to find anything that is paid or doesn’t require business and administration based experience. A big part of me wishes that I could work as a volunteer fulltime but it isn’t realistic especially living in London. I need to observe people presenting for the charity before I can present so looking forward to seeing how different individuals tell the story of their cancer journey. I’ve been thinking about what I might say and how I can engage, encourage awareness and promote the organisation I am representing. It makes me reflect on the path I’ve been on and the journey I have had. The things I have learnt about Cancer and about myself. It makes me think about how incredibly resilient the human body is and how the mind along with positive affirmations can heal you from the inside out. It also makes me realise how important support networks are to the healing process and how they can really pull you through. Its so weird and surreal to look back and see how much I’ve changed not just physically but mentally too. I’m also trying to establish contacts for when I get back to New Zealand to potentially get work in the Cancer sector. Things are looking positive so I guess watch this space. As a 28 year old (gah almost 29!) I look upon my life and realise how much I have achieved and what experiences I have had. I reminice about the people I have met and how they have impacted my life and I think how lucky I am to be back into the light after a year of medical darkness. I still can’t believe that I’ve had cancer and survived it. Considering I was fit and healthy before I was diagnosed it just proves that you never know what might happen in your life and alter the path you are on at that point in time. I hope with all my soul that the cancer never comes back and the preventative steps I have taken work bit there is no real guarantee. It’s never at the forefront of my mind but in a lapse of happiness I am reminded that it’s been there once what’s stopping it from returning. Surgery, radiotheraphy and herceptin are all preventative methods to stop the cancer returning. In the next couple of months I have to have another Echo, a Mammogram and another CT scan along with the three weekly round of Herceptin…..sometimes it feels never ending. Chemotherapy has a different range of side effects to radiotherapy and the fatigue is so different. I think it has hit me a bit recently and some days I am much more tired than I am on others even if I feel like I have slept well. It almost feels like constant tiredness and I feel like a bottle of fizzy that’s been shaken up. After a while when the bottle is opened the force of the gas isn’t so quick to go every where but seaps out all over the place. Its such a “blah” feeling – I kind of compare it to a hangover. I have been told that it can take up to two years to feel completly normal so I guess it will be up and down for a while yet. Glad that the weather is improving! I need sunshine to improve my mood. Since I got back from my big trip in to Prague, Munich and France life has been pretty quiet. The ANZAC dawn service at Hyde Park was a bit of a highlight and getting up at 330am to catch the bus was not as difficult as I thought it would be. Getting out of London for the long bank holiday weekend was really great. Kate, Sarah, Catherine, Natasha and I hired a car and spent three nights in Grasmere, Cumbria which is about a five hour drive north of London in the Lake District of England. We had some great laughs and spent a good portion of time taking silly photo’s which was pretty entertaining. We did a lot of driving around and made it to Beatrix Potter’s home which was lovely. The weather was a bit grey and rainy but we managed to get one large walk in. We have another week of school holidays coming up so Catherine and I are heading to Morocco for 8 days which will no doubt be fantastic. After we get back from that I will be in save mode for summer and getting organised to move out of our flat. 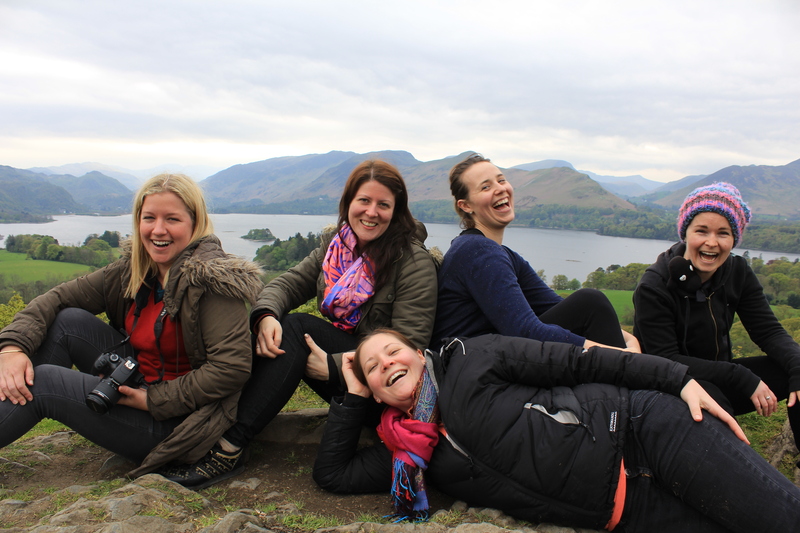 Natasha, Kate, Catherine, Sarah and I – Lake District, Cumbria. England. May 2014. So not that much to report really. Just a bit of a winge to let you know that indeed while I have remained positive through this experience I am still human. Positive things are happening and I do feel good about the future it’s just creating the steps in order to get there. Looking forward to it no doubt. Can’t believe it’s almost been a year since this Cancer journey started. Pretty proud of myself for what I have achieved.